Officially tested prefabricated strongrooms have replaced traditional concrete vaults in many banks, companies and institutions. Prefabricated strongrooms are also used in private panic room installations. The increase in their popularity is based on high security, consistent quality and certified burglary resistance. 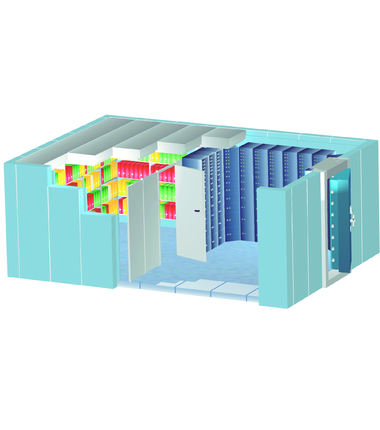 The strongroom scope of supply can also be customised to meet individual project requirements. Officially tested prefabricated strongrooms have replaced traditional concrete vaults in many banks, companies and institutions. Prefabricated strongrooms are even popular for private panic room and safety room installations. The reason for high success for prefabricated strongrooms is based on high security, stabile quality and evaluated burglary resistance proofed by the certification. Kaso offers wide range of prefabricated strongrooms and archive rooms tested and certified according to European Standard EN 1143-1. Prefabricated elements are finished with high quality steel panels constituting of different barrier materials depending on the grade of burglary protection and optional explosion or fire protection resistance. Prefabricated elements are attached with indentations, making it extremely difficult to break the structure. The panels are secured by welding or by bolting where welding is not possible nor allowed. Strongrooms can be supplied with prefabricated element or steel plate floors. Surface finishing likepainting or cladding can be finalised by local contractors. • Preparations for ventilation, alarms etc. Officially tested prefabricated strongrooms have replaced traditional concrete strongrooms, safe rooms and bank vaults in many banks, companies and institutions. Prefabricated strongrooms and vaults are also used in private panic room installations. The increase in their popularity is based on high security, consistent quality and certified burglary resistance. The strongroom, safe room or vault scope of supply can also be customized to meet individual project requirements. 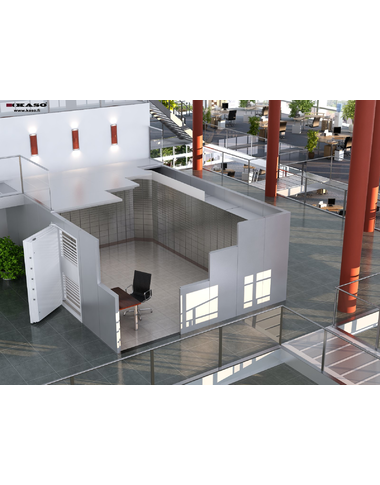 Prefabricated light weight safe rooms and archive rooms are modern physical security solutions especially designed to office and public building installations. Light weight safe room panels are easily assembled by welding or bolting the elements for example if welding is not allowed. The vault doors used with safe rooms are offering the same burglary resistance as the strongroom elements. The loadbearing capacities of the building floors are also better utilized leaving more storing capacity to the safe room. 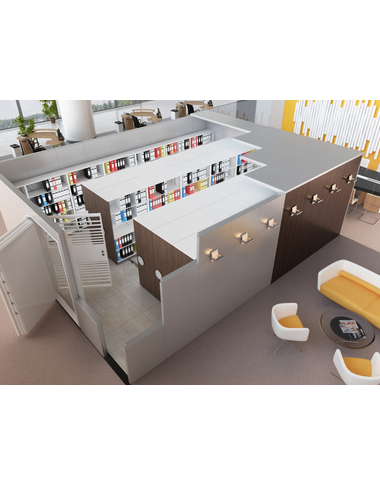 Prefabricated safe rooms and archive rooms are suitable for banks, companies and institutions. Prefabricated safety rooms are even popular for private panic room installations. Light weight safe room panels are available with break-in resistance Grade I and II according to EN 1143-1 by ECB-S. The fire protection classification of the safe room panels is 60 minutes. The fire protection level could be optionally increased with additional fire protection panels. Safe rooms can be supplied with element floors or the elements could be also installed directly on top of existing floor. Surface finishing like painting or installation of decorative panels can be finalized by local contractors enabling the integration of the safe room to the surroundings. Officially tested prefabricated strongrooms and vault doors have replaced traditional concrete vaults in many banks, companies and institutions. Prefabricated strongrooms and vault doors are even popular for private panic rooms installations. The reason for high success for prefabricated strongrooms is based on high security, stabile quality and evaluated burglary resistance proofed by the certification. Kaso offers wide range of prefabricated strongrooms and archive rooms tested and certified according to European Standard EN 1143-1. Prefabricated elements are finished with high quality steel panels constituting of different barrier materials depending on the grade of burglary protection and optional explosion or fire protection resistance. Prefabricated elements are attached with indentations, making it extremely difficult to break the structure. The panels are secured by welding or by bolting where welding is not possible nor allowed. Strongrooms can be supplied with prefabricated element or steel plate floors. Surface finishing like painting or cladding can be finalized by local contractors.